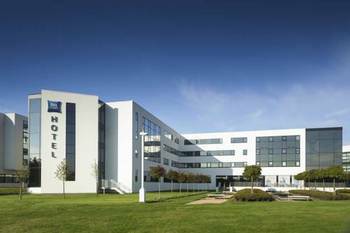 A good budget hotel located near Edinburgh International Airport. Also about 30 minutes from the city centre. Fancy a golf break on a budget? If so this is the right place to do just that. Ibis budget has the cheapest rooms of any of the hotels in the Ibis chain. They are basic rooms without any of the frills but, clean and comfortable as well. There is usually a bar and breakfast buffet that will cost extra. However everything here will still be very good value indeed. This is what we are built for. Giving you the best cheap rooms on offer in the area. Also remember we are in the land of the canny budget Scots! You will find us approximately 2.8 miles (about 7 minutes drive) East of Edinburgh Airport. There is a tram stop just across the road from us. This mean in about 25 minutes you can get to Murrayfield. Also just over 30 minutes on the bus will have you right in the centre of the city on Princes Street. Surrounded by 9, yes 9 golf courses all within 5 miles. This makes this Ibis the perfect spot to stop for that leisurely break before or after flight. You will find it very difficult to get better value accommodation for a golfing holiday than this. Spend you hard earned wages oat the 19th, not on a swanky hotel room that no one will see.